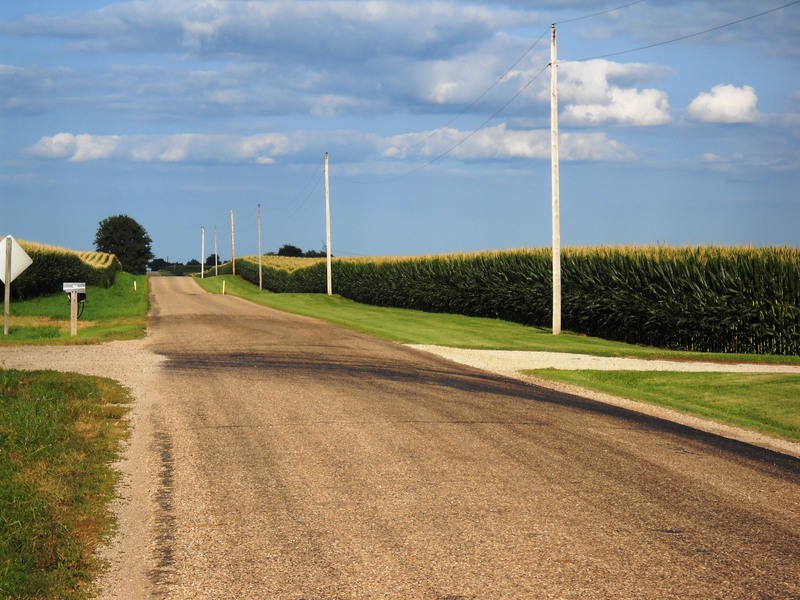 Last week, I shared a pictorial “travelogue” perspective of our recent visit to Illinois State University and the surrounding twin-towns of Normal and Bloomington. Or, Bloomington and Normal, if you prefer. Or Normington. Now for some recollections, insight and observations gained from 48 hours in a place that had a profound impact on my life. 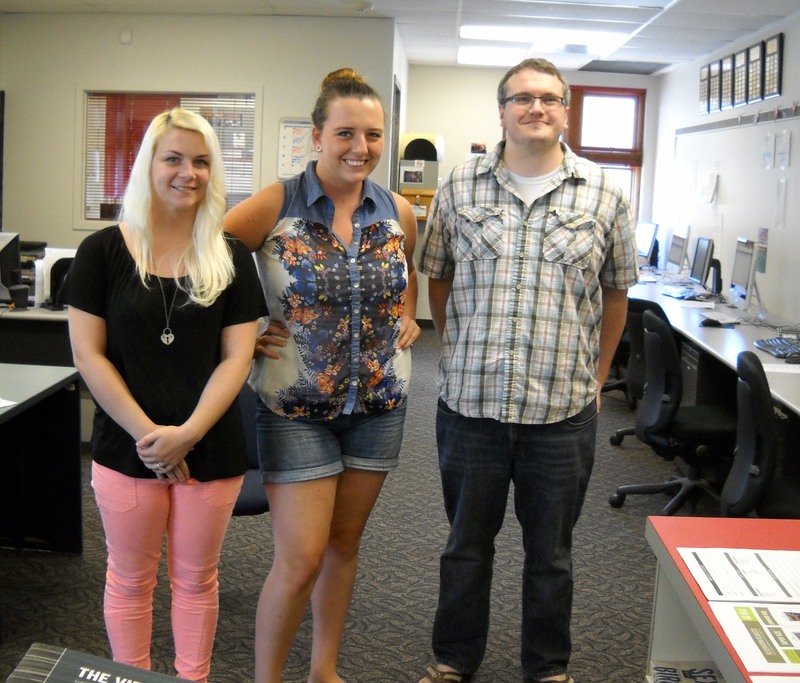 Shout out to these three cool members of the Vidette staff for their hospitality. Glad to learn the newspaper continues to thrive. The Vidette: One of the highlights of my time on the ISU campus this July was the short visit made to the offices of the ISU Vidette, the university newspaper. For a couple of semesters, I was a member of the Vidette editorial team; my assignments ranged from features and editorials to the student government — one of the top beats. Thanks to the three friendly Vidette staff working that day, I got an opportunity to scan through archives of issues from 1975 and 1976 and read some of my articles. Some leads were pretty weak, but overall I was proud of my copy. My Vidette takeaway: While on staff, I learned what it was like to work in a newsroom, a lesson that served me well after I landed my first post-graduation job at the City News Bureau of Chicago. Better yet, the experience taught me how to work in a team environment. 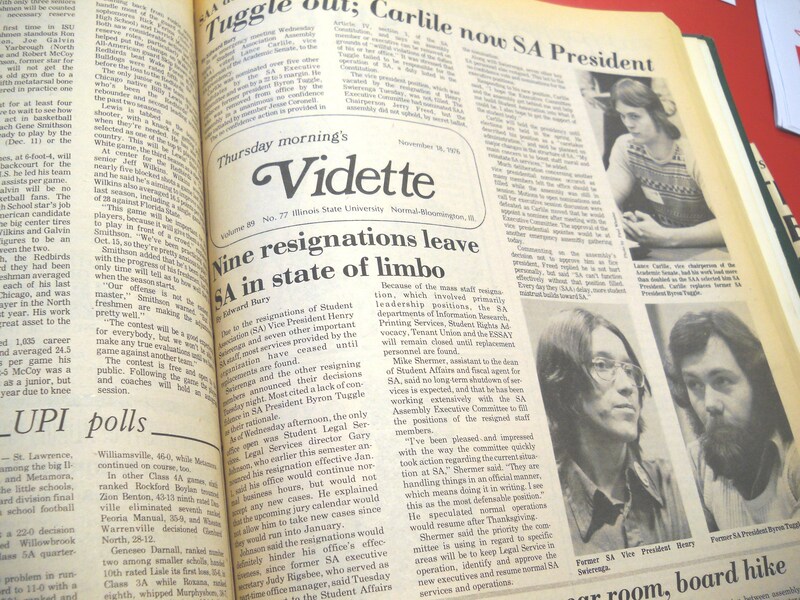 Whose byline graced the top two articles on page one of this 1976 issue of the Vidette? Yes, Edward Bury. I added the “M” a few years later. The Campus: Even before I visited ISU during a “Preview ISU” tour offered to incoming freshmen, I was somewhat enamored by the campus, especially the Quad, with its trees and crisscrossing walkways and framed by buildings of various architectural character. That magic was still there, as I remembered all of the buildings — all of which were open — the names of streets near campus and the hulking dominance of Watterson Towers from just about anyplace on campus. My Campus takeaway: Hearing a student on the ground floor of Cook Hall practicing the xylophone. I listened behind a closed door and felt both pride and jealously: Proud that like me decades earlier, a student was pursuing his or her passion; jealous that I wasn’t starting that phase of my life. Yes, they grow corn, and soybeans on the flatlands around ISU. Thankfully, much of it still remains undeveloped, like this road on the outskirts of Bloomington. The Community: My Chicago neighborhood had turned into a pretty rough place during the 1970s, a predominant reason why I wanted to earn my college diploma someplace far away, someplace where I wasn’t afraid much of the time. I found that place just three hours away, in a place called Normal. The lure of college-town U.S.A. didn’t keep its hold on me much beyond my three-and-a-half years as a student; but the community gave me a chance to learn about life outside the streets of Chicago. My Community takeaway: Three of the houses I lived in off campus were gone, replaced by apartments or retail strip malls. As a long-time real estate communications guy, I fully understand the principles of highest and best use and supply and demand. But it was a little sad to learn that progress now overshadowed memories of living in old homes on South Fell, West Willow and South Main. No, I did not finish the entire sandwich. The Flatlands: The terrain in and around Chicago is pretty flat, even though we have suburbs named Mt. Prospect and Arlington Heights. But I never new flatlands until I spent a few years living in Normal. From the top of Watterson Towers, one could see the proverbial patchwork quilt of fields from horizon to horizon. The prairies and plains of Central Illinois probably won’t match the Grand Tetons for awe-inspiring natural beauty. But for this Chicago kid, they were serene and beautiful in their own way; plus in 1973, I could ride my bike for 20 or so minutes and be in a world far beyond the confines of the campus. 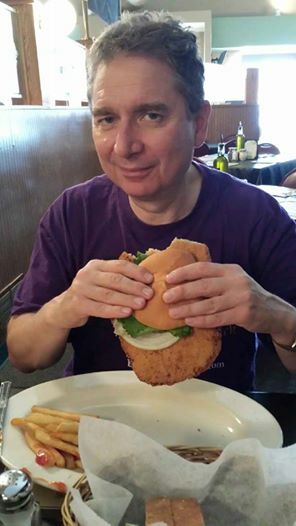 My Flatlands takeaway: On our drive down to ISU, we stopped in Pontiac for lunch, where my appetite was suppressed by one of the largest sandwiches on earth. (See accompanying photo.) From Pontiac we found one of the few stretches of old Route 66, the Mother Road, and followed that to Normal. Not much to see but farms and road signs — what you find on the flatlands; but that was okay. After all, I was looking to get back to Normal.